When you come to think of it, many countries – most, perhaps – have a cuisine to call their own. A culinary tradition born of a combination of geography and natural resources, and possibly (thinking of France, particularly) seasoned with a passion for all things epicurean. Chinese food, for instance, though it varies from one region of the country to another, could only really come from China. India may be a vast subcontinent with many culinary variations, but Indian food is instantly recognisable. Traditional Icelandic cuisine might be hard for some to stomach – dried puffin, fermented shark etc – but it makes perfect sense for a barren island in the North Atlantic. Britain had a cuisine, too, once upon a time – but since the days of empire we’ve become a nation of gastronomic magpies, as comfortable today with a chicken korma or prawn chow mein as we are with roast beef and Yorkshire puddings. 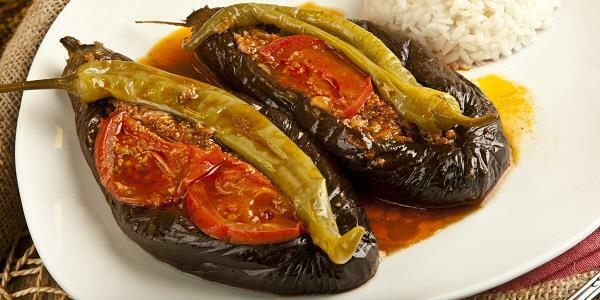 Popular not just in Turkey but in Bulgaria, Macedonia, Albania, Armenia, Greece, Israel and throughout the Arab world, Karniyarik is a dish of aubergine stuffed with a mixture of sautéed chopped onions, garlic, tomatoes, green pepper (optional), parsley and minced meat, usually lamb, then seasoned with black pepper. There’s also a vegetarian version, imam bayildi. Both versions have similar equivalents in Iran. Karniyarik’s widespread appeal is surely evidence, if it were needed, that what Turkey takes (in culinary terms) she gives back. 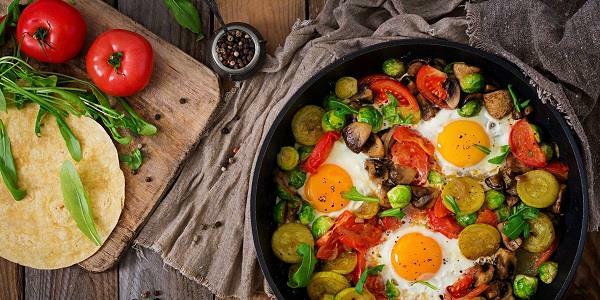 Originating from Tunisia (or maybe Morocco, or maybe even Turkey itself) shakshouka consists of eggs poached in a tomato, chilli and onion sauce, usually spiced with paprika, cumin and cayenne pepper. It’s popular not just in Turkey but throughout the Middle East; and no wonder. I mean, just look at it. The breakfast of champions. 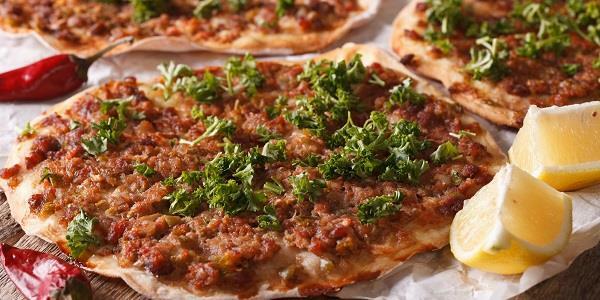 Also known as Turkish pizza, lahmacun is a round piece of flat dough topped with minced lamb or beef; finely diced vegetables such as tomatoes and onions; herbs and spices like parsley, cayenne pepper, paprika, cumin and cinnamon; and then baked. Like tortilla wraps, lahmacun are often used to contain other fillings: vegetables, mainly. Lahmacun is (or are) widely consumed in Syria, Armenia and Lebanon. Quite who should claim ownership of this one is anybody’s guess; surely it’s as Greek as it is Turkish? But then what does it matter, so long as the end product is delicious? 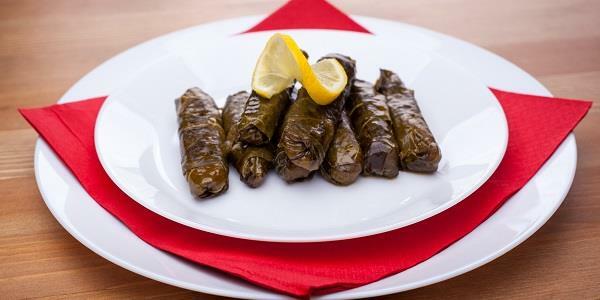 Sarma is a dish of vine, patience dock, chard or cabbage leaves encasing a filling usually consisting of rice or bulgur grains, and minced meat. Sarma is a feature of cuisines throughout the former Ottoman Empire, from South-Eastern Europe to the Middle East. And finally, pudding: baklava, a sweet, rich filo pastry filled with chopped nuts (usually pistachios, as seen here) and further sweetened and bound with honey or syrup. Variations on baklava feature in Levantine, Balkan and Central and West Asian cuisine, but the Turkish stuff is the real deal. 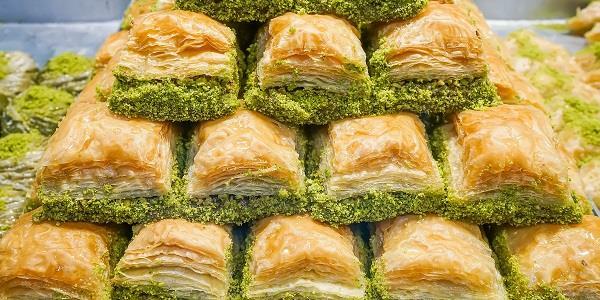 Turkish food in Britain has come a long way from the greasy kebab shops of yesteryear. Nowadays there are few big cities that don’t boast at least a couple of good Turkish restaurants; and the trend is trickling down to smaller towns too. Nonetheless, holidaymakers at Physkos are spoilt for choice. The small fishing village of Turunç, lapped by a limpid Aegean Sea, boasts nearly 20 fantastic eateries, many overlooking the beautiful Turunç Bay and none more than a five-minute walk from the holiday site. Your chance to sample the true tastes of Turkey.